No! it’s easier than all that. 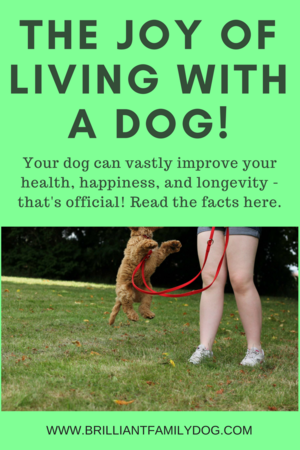 It may surprise you to know that what has been proven to improve your life - your happiness, your health, and even your longevity - is sharing your life with a dog. Not only is a dog proven to bring many good health effects - a dog is fun! Of course, those of us who have shared most of our lives with dogs know this already. Some may think that’s all sentimental nonsense. But no - here are some facts about the effects of living with a dog. Even insurance companies may ask if you have a pet if you’re over 75. Now they’re speaking through their wallet, so they are convinced! You can’t argue with those at any stage of life for all-round health and self-esteem. And how many can your pet dog help you with? • Your dog will get you out and about regularly - from forest trails to the local shops, from dog classes to dog sports, he’ll get you moving as well as introducing you to new friends and acquaintances. Consider a class on scentwork, for instance, which will open up your mind as well as being heaven for your dog. • All this fresh air and getting out and about will give you an appetite and encourage deep sleep. • Nurturing gives people a purpose and value: giving your pet time gives you time. • Putting someone other than yourself first will stop you slipping down the road towards self-absorption, loneliness, misery and blame. • When you’re worried, turn to your dog for a quick dose of mood-elevating hormone, by stroking her or simply gazing into her eyes. • Dogs live in the present - when nothing is required of them, they sleep: their example is worth a good few meditation classes. You needn’t dwell in the past, live now! All of this is from your average pet dog at home. That’s before we even look at the dog’s astonishing abilities in cancer detection, seizure alerts, hearing for deaf people, easing Post Traumatic Stress Disorder in veteran soldiers, and general assistance, to name but a few. Dogs are straightforward - there is no hidden agenda. Contrary to what you may have seen on popular tv programmes, they have no wish to rule the world. They are not stubborn or self-willed. They value a warm bed and a full bowl and are keen to fit in with you. Dogs respond best to reward-based interactions involving choice. What a simple and stress-free way to interact with anyone! There’s no need for you to become a drill sergeant, no need to have a battle of wills. You want this dog to lower your blood pressure, not elevate it! Instead of barking, “Sit! Down! Stand on your head!” you can quietly say “What do you do when I pick up your lead?” You’ll get the response you want (a sit, perhaps) and everyone is staying calm. Treat your dog as you’d treat a young child in your family and just enjoy peace and harmony together. And lots of gazing into those melting brown eyes. 1. Vet J. 2003 May;165(3):296-301. Neurophysiological correlates of affiliative behaviour between humans and dogs. J Behav Med. 1988 Oct;11(5):509-17. Cardiovascular effects of human-pet dog interactions. 3. Cline KM (2010). Psychological effects of dog ownership: role strain, role enhancement, and depression. J Soc Psychol. Mar-Apr;150(2):117-31. 4. Headey BW, Fu Na, Zheng R (2008). Pet Dogs Benefit Owners’ Health: A ‘Natural Experiment’ in China. Soc Indic Res. 87:481-493. 5. Horm Behav. 2009 Mar;55(3):434-41. doi: 10.1016/j.yhbeh.2008.12.002. Epub 2008 Dec 14. Nagasawa M1, Kikusui T, Onaka T, Ohta M.